The Voltage Follower is probably the most simple module in the Synthasystem. In fact, it is actually two units in one module. "Voltage follower" is yet another name for slew, lag, glide, portamento, etc. The power regulation is all on the PCB. As before, I've omitted the Doepfer power header and LEDs... I won't mention this in the future. I also haven't installed the LM741s or the heatsinks. 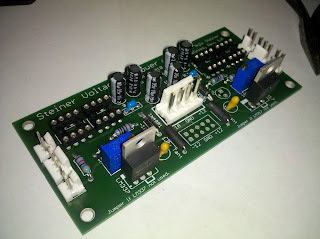 The panel components are pretty simple: a pot and two jacks (input/output) for each of the two followers in the unit. While I'm at it, I'll mention that all of the boards are set up for using MTA100 connectors. I'm comfortable with these, having used them on my Dotcom system. The "T"-handle tool is a bit of a pain, but it has grown on me. The MTAs are probably a little bit overkill for a banana jack system (and some of that panel wiring can be fun), but it certainly can't hurt.